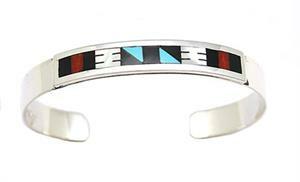 Sterling silver 5/16" wide bracelet shank with traditional multi color (turquoise, coral, jet, shell) inlay on top with a square wire border around the inlay. It is Zuni hand made by Leander Othole. Inlay patterns may vary.